Three DVDs have been produced featuring dances taught during recent years. The first covers dances taught between September 2007 and February 2008, the second covers dances taught between March 2008 and April 2009, and the third dances taught between September 2009 and May 2010. 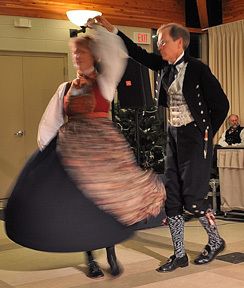 For each of the dances, Linda and Ross provide a demonstration of the dance along with descriptions of the men's and women's steps, holds and figures. The DVDs can be purchased at any Scandia DC event for $10 each (sorry, we are not equipped to do mailings). Email linda@scandiadc.org ahead of time so we will be sure to bring copies for you. We are very grateful to Martin Misakian who was the driving force behind the production of Volumes I and II and to Bernie Rappaport and Alan Potter who did the recording and editing for those volumes.